Come back to charm & character in this inviting Greens Farm's Home. The first thing one will notice is the tranquil 2.19 acre setting. 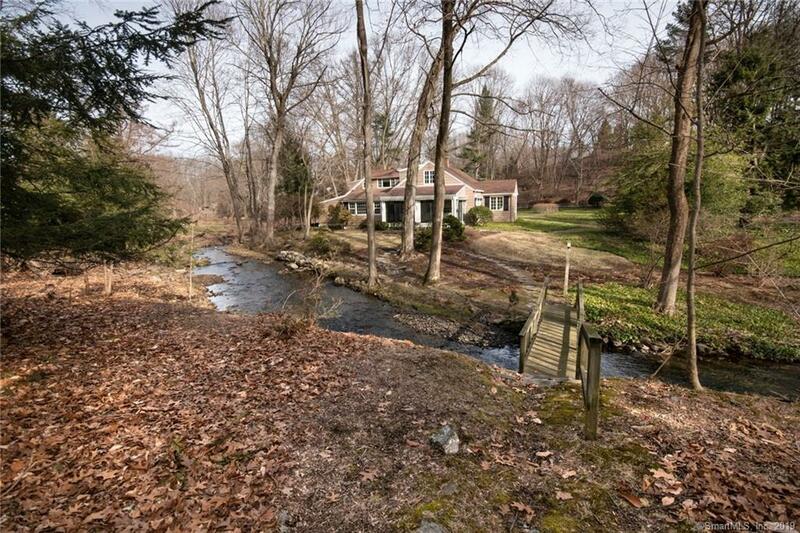 65 Center Street is enveloped by a babbling brook, has stunning views & the soothing sounds of nature. Inside, one will find an interior that matches the exterior setting; there is an immediate sense of warmth that permeates the house. The front door boasts an oversized foyer w/ built-ins & lovely millwork. There are rich hardwood floors, an extra-large dining rm w/vaulted ceilings, an ample living rm w/an oversized wood burning fireplace & lots of built ins. This living rm opens to a Sunrm w/ beautiful views of the lawn, brook, & a charming bridge. There is also the added surprise of a butlerâs pantry. The kitchen is sun filled with skylight & pleasant dining area. There is a convenient side entrance w/a mudrm space & laundry rm. A den provides a quiet sanctuary to watch television or reading & like many rooms in this house has built ins for storage/display. There is also a 1st floor bedrm w/a full bathrm. The 2nd floor has an ensuite Master Bedrm Suite w/ its own o?ce & extra sitting area (or gym or bedrm with its own separate staircase and bathroom). Another bedrm is also ensuite. Some unexpected surprises are a security system, central air, central vacuum, a wine cellar, a furnace that is only a few years old, and a two car attached garage. Conveniently located in the coveted Greens Farms area-walking distance from the trains. Directions: Greens Farms Road To Center Street, Go Down Driveway For #65 And 67. House All The Way At End Of Driveway (Second House).